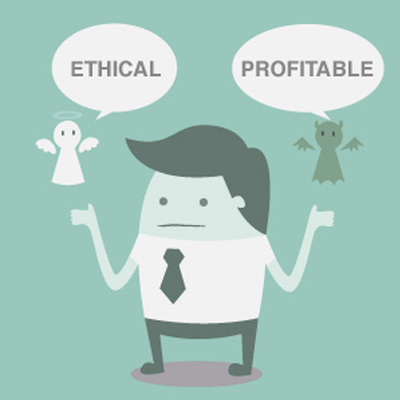 Ethics, as a term, is often believed to be an expensive practice that causes the organization to forego profits. Organizations must remember that any benefits from lying, cheating, and stealing usually come at the expense of their reputation, brand image, shareholders. Therefore, leaders and managers should work hard to be ethical and remain that way. Some project managers believe that being ethical is too expensive for the project and that it may cause them to forego profits. It’s not true. It’s not unethical to make profits, but it does matter about the way profits are earned. Ethical companies are more trusted by people and this trust provides higher chances that the organization will remain profitable and continue to grow for many years. There are studies which show that people are willing to pay a premium for an ethical company’s products and that ethical organizations have continued to survive and grow. Organizations should not to resort shortcuts and unethical means in order to generate profits because that will be disastrous for the project, client, and the organization in the long run & highly damaging to the social image and brand. For new-age companies, being ethical is becoming an increasingly important component of their business practice, particularly in the era of fast Internet, powerful social networks and smart instruments where opinions and perceptions can flow at lightning speed. Unethical behavior can be extremely profitable in the short run. But a business is supposed to create long-term value for its customers and shareholders. These tricks will not last for long . It is observed that sometimes the ethical violations committed by the project manager(s)/ team member(s)/ organization looks profitable for the short term. Being ethical in projects and organizations also pays future dividends. If a project manager or business leader is ethical, often the employees or team members feel very safe and secure enough to air their thoughts & promoting innovation. Today’s young workforce is very dynamic and full of new-age ideas and therefore, they feel comfortable joining teams/companies which feed their imagination and ideas. Leaders who are ethical in their practices are the most sought after by the millennial generation. According to one of big four consulting organization’s fourth annual Millennial Survey, which includes 7,800 of tomorrow's leaders from 29 countries, the value of strong business ethics is increasing. This accentuates the fact that today’s young workforce also prefers to join ethical organizations that they can trust for their future growth. There are clear examples cited by an experiment conducted in 2008 by Remi Trudel and June Cotte, that prove that ethical behavior and actions appear to be a wise investment. It showed that if you act in a socially responsible manner and advertise that fact, you may be able to charge slightly more for your products. On the other hand, it appears to be even more important to stay away from goods that are unethically produced. Consumers may still purchase your products but only at a substantial discount. In this study, when customers were told of the practices of the companies producing the coffee they bought. They did not mind paying a premium for the company with ethical practices, as opposed to the price where there was no information about the company’s practices. But when customers were told that the company was involved in unethical practices, they punished the product by asking heavy discounts and the customers were not willing to pay the regular prices. There were customers who were not willing to buy the product at all. The lesson is very clear. Customers, who care about high ethical standards, are the ones who can contribute to biggest potential profits on ethically produced goods. There should not be any hesitation in being ethical as this is a long-term investment in making current and future customers your loyal partners. When companies work ethically, they naturally outpace competitors who are unethically working for expanding profits. It is simply because customers see them as a trusted partner, not only for what they do, but for how it is delivered. In spite of all the systems and preparations, risks are never completely eliminated. Our worst nightmares become real. Catastrophes happen. Recently, I had to lead my team through one such ordeal. My thirty years of experience in the industry was a great help. We managed the situation and came out with minimum damage. We have introspected about the sequence of events. The learning from this unique experience enriched me as well as my team members. I am sharing them with you, hoping that these insights will be useful to you in case of any emergency situation. A crisis can overwhelm you. It tests the team and its leader. In certain moments, I felt that the crisis was beyond the capabilities of entire team members; it made me doubt the capability of my team. Next moment, I tried to act tough, work more, cheer up the team more. As the crisis is now over, I wonder, “Am I the one who led the team? Is this the team who did all those wonderful things?” In the situation of crisis, not only does the leader’s performance increase many folds but each team member contributes significantly more than his or her normal capacity. The hormones definitely help. The key to self-talking for survival is to believe that it is possible to surmount the difficulties. You must act to make your team believe in your self-talk. Human behaviour in such periods is unique. We are programmed to work with unity, so have strong faith in your team. The persons who used to work against each other in the normal situation will manage to work together- just command them to do so and see the human magic happening. It was during this crisis that I realised how synergy can catapult the effort of small human beings to achieve giant results. The clear instructions for action makes the team members believe in their capability. They accept that there are no perfect actions. This acceptance is a key in building and maintaining synergy. Top leaders often express that effective communication is their most difficult task. In a crisis situation, communication breakdown can frustrate you. You need to work overtime to make sure that communication is effective. Use all methods- even if you write on the palm of a person so that he/she does not forget your instructions, it is fine. Cross checking by asking your teammates, ‘Can you tell me what you are going to do?’ is a must. Misunderstanding can waste both time and scarce resources. The feedback cycle, making sure that instructions are really happening, is important. Just because you have passed an instruction and it has been understood, does not mean that the task you have assigned will automatically complete itself. Check and recheck. Do this as often as is possible. Communication systems, like a public address system or walkie-talkies, make communication very effective. If one team member is in need of help, using such a system, he/she can communicate the problem to others, and the best person can come forward to help them. Having systems like this in place can be very beneficial, because it gives every team member the opportunity to communicate with many members of the team. Such events synergize the team and assure them that they are not alone. Effective execution of instructions in a crisis situation gives the desired result. All resources and manpower are to be utilised optimally. Assume that your present plan or action is not going to yield the desired result and train yourself to keep thinking of alternative solutions throughout the crisis. This makes sure that various resources are not idled and more execution of the right type happens. The number of actions per hour leading towards the desired outcome is a key statistic that decides the outcome. Remember that your team members are excited and can do more than what they used to do in ordinary times. So do not shy away and ask for average tasks. Believe in your people and ask them to execute extraordinary things. You will be pleasantly surprised when they rise to the occasion. Standard operating procedures may not work or may not be adequate in an emergency situation. Innovation on the run is essential. A culture, in which people have the habit of offering suggestions and new ideas, is likely to have more success. Systems, in which stringent control is the norm, may not give desired results. When team members know that they have adequate freedom in trying various methods, the chances of success is better. In a crisis that I faced recently, we had about 100 innovative “out of box” ideas in a month. These were accepted and implemented. Some were extraordinary, some did not yield desired results and some were outright failures. The key is to accept ideas and work on the good ones. Under time and resource constraint, execute the suggestions in pilot form and improve upon them later. I have tried here to summarize my own experience, trying to find out how the leader, the system and the environment work towards the desired outcome. I hope that this would be useful to you too. Do your customers know what they need? In a conversation with a colleague last week, we were discussing about how we should work towards understanding customer’s need accurately both from a functional as well as emotional perspective and attempt satisfying them in a financially viable (rather, profitable) model. A need is a benefit sought by a customer in a specific context. While some needs are stated explicitly, many others are left unstated and require us to observe them. As marketers, our job is to understand important customer needs, and provide solutions that satisfy those needs. To run successful, profitable businesses (especially in the services industry), it is imperative for companies to bridge gaps between what I call “Perceived”, “Actual” and “Contractual” needs. Perceived need is what the customer “thinks” he / she wants, Actual need is what the customer “really” needs and the Contractual need is what the customer is going to “pay you for addressing”. As marketers, how do we address the difference between these and get these circles to overlap completely? Start with the “problem”. Instead of going by what the customer says he / she needs (which is invariably a solution he / she has already thought of), work on identifying what problem he / she is trying to solve. This can be a good starting step for you to think of possible solutions to solve the problem and arrive at the actual need. You can then identify the differences between this and what the customer’s perceived needs are. The next step is to try to handle both needs together, linking them in your customer’s mind. One suggestion would be to gently educate them that their perceived need many not be the ones they actually need. Make them understand that the actual need is the one to be addressed. This is tough for marketers though. There is a very thin line between being seen as someone who takes care in the customer’s interests and someone who is arrogant & insulting. Your competitors are waiting to do “whatever” the customer wants and take their money. Treat both, the perceived and the actual needs as sensible ones by taking a very neutral, educational tone. The third piece is agreeing on the commercial model that is required to address the needs of the customer. The customer is going to pay you only for what is written in the contract. So, it is very important to work with the customer and arrive at the “contractual” need (often referred to as “Scope”) and map it as close as possible to the perceived and actual needs and build a commercial model that supports this. I am not trying to say that customers do not know what they want - I would like to emphasize that the customer knows his / her business & problems the best. The only thing you can consult / educate them on is how you can help them solve their problems (or address their needs) with solutions that you provide. Doing what I have indicated above can only take you closer to solving your customer’s problems and satisfying them in a way that is commercially viable for you. Now, wait a minute - did you read it right? Yes, it's not an oxymoron. I mean it. Of course Virender Sehwag (aka Viru) won't bother to write about strategy, let alone reading even one para written on the topic. Most people won't even remotely associate Viru with strategy when the media and our imagination is replete with leaders, captains, coaches, and pundits on who ought to make strategy and how it must be made (only that it makes sense at the hindsight). However, being an Indian, which makes me a cricket fan by default and a student of strategy, I can't resist but venture highlighting a few insights one could draw from an astonishing career Viru had over more than a decade now. Fewer people have made such an impact on the game of cricket as this gentleman has and there are few nuggets one could and should draw from here. Tell me - how do you differentiate between 'a bad strategy' and 'a good strategy badly executed'? After all strategy is as good as execution. When you see Viru playing his cricket, there seems to be no semblance of strategy. One could assume that there is no strategy, which I think isn't true, at least in Viru's mind, but he seldom let strategic prescriptions override his natural instinct. When was the last time you saw Viru out of his instincts trying something that's been told to him 'shall work'? Rarely. For as long he played, his instincts ruled everything else. Managers, sportspeople and academics alike acknowledge that a strategy is as good as its execution. Still better great execution can always be construed as a well drafted strategy in the hindsight but a strategy (read plan of action) stands no change in the face of poor delivery. Sehwag exemplifies execution, as Sunil Gavaskar used to comment – “if it is a bad delivery, (Sehwag) will hit it and if it a good delivery, again he will hit it”. That's simply execution paying little attention to 'strategy'. That calls for keeping things simple, which itself calls for a very clear mind. Name the most fearsome batsman India has ever produced? I bet Viru would figure in top three, if not right at the top. Every cricketing nation has one or two most feared players for every generation and for past several years it was Viru for us. He might not be the best in terms of techniques (least of all), or records, or consistency, but he was very unpredictable and hence lethal. Even after dozens of books written on Apple or Toyota or Google, the practices of these firms are hard to imitate, let alone understand. That's because there exist severe causal ambiguity, or unclear cause-effect relationship between governing factors. That's what makes firm's distinctive advantages sustain over long period of time. Almost every player could be categorized into one of the several archetypes, but not Viru and I think MS Dhoni comes a close second. What makes these players absolutely idiosyncratic is that no one, not even they themselves, know why it happens what happens. MS is at least good as hindsight analysis! Viru is crude here. Possession of such resources, which are highly unpredictable, offers a great advance to the focal team and always keeps the opposition guessing. The causal ambiguity also stems from the fact that neither Viru nor MS play based upon prescribed 'good practices'. In fact, they create practices on the fly, as need may be and let other handle the justification and proliferation. That's precisely the hallmark of disruptors. They aren't governed by the rules neither they bother to change those. They just do it! Have you ever heard the term 'paralysis by analysis’? That's what happens when you are trying to solve a case in a B-School setup, or in a one-day strategy workshop with your colleagues. You spend too much time analyzing the facts, or even hunches, while paying little attention to creative solutions or moving on to the next steps. MBAs are infamous for that and worst still, expect others to construe this as their ability! As for Viru, his cricketing style is (I think) governed by few very simple rules. Such as - hit the ball when you see it and don't get out cheap or - don't pay any attention to the bowler's reputation and the format of the game. Who else can cruise at a 300+ score in a test match with over a strike rate of 100? That fearlessness can come only with clarity and the clarity can't come with too many rules to follow, let alone books to read. I will keep it just at three, for if ever Viru comes across this post he should not feel it being just too much!